Welcome to the home of the world's most intense action-pong video game... bringing together America's two favorite activities: shooting our friends and playing pong. This may seem like an odd combination, but just wait until you feel the heat of the battle. Also keep in mind that combining guns and skiing sounds even more ridiculous, but that's an olympic sport. This site brings you all the news you need to stay in touch with HBP. Conveniently, there isn't very much news. Also, unless you have a very expensive haptic interface and you want to play video games with it, you probably don't "need to stay in touch with HBP" at all. Manual (html) The manual for HBP, complete with screen shots (well actually just one screen shot) and other information about the game. HBP (HDAPI) The most current version of the game itself, as a zipfile. This presumes you have a SensAble Phantom and Sensable's OpenHaptics drivers. If you have an Omni, this is the build you want. It will also support older Phantoms, as long as you have the OpenHaptics drivers (see SensAble's drivers page). HBP (Ghost 4) This version presumes you have a SensAble Phantom and Sensable's Ghost 4.0 drivers/dll's. This is fully compatible (network-wise) with the OpenHaptics version listed above. HBP for Ghost 3.1 An older version of the game for folks who have a Phantom with Ghost 3.1 instead of Ghost 4.0. Note that this version is no longer current, and will not work over the network with the new (Ghost 4) game. If there is a single person in the world who really wants us to compile the new version for Ghost 3, we can. 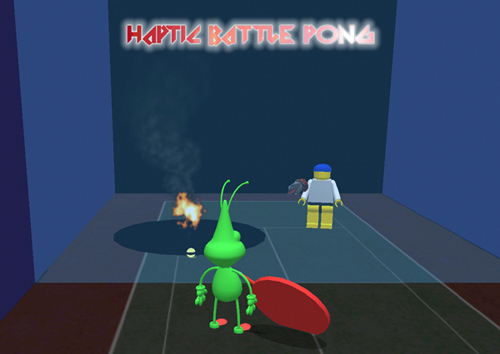 However, since we estimate the total Haptic Battle Pong audience at around 5 people (including the authors), we find this scenario unlikely. HBP on /. Haptic Battle Pong's moment in the sunshine, where Slashdot is "the sunshine". If you do have a Phantom, and you do ever end up wanting to try out HBP, feel free to contact either of the authors (Dan or Neel) and we'll either play or point you to someone who will.